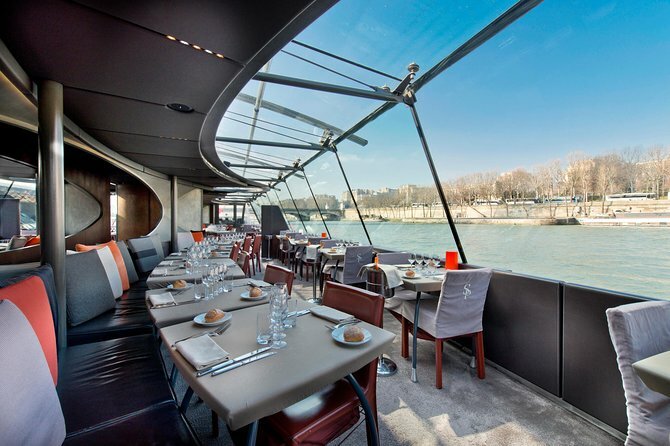 Sit back, relax and enjoy the views of Paris’ major attractions lining the beautiful Seine, whose historic riverbanks are designated as a UNESCO World Heritage site. Starting at the imposing Eiffel Tower, your route takes in iconic Notre Dame-Cathedral, the buzzing Latin Quarter and the Parisian Statue of Liberty, as well as world-famous museums such as the Musée d’Orsay and the Louvre, as you cruise to La Bibliothèque Nationale and back. Your boat’s glass roof and large panoramic windows offer great views from every seat. A great way to spend your first afternoon in Paris. After flying all night and arriving early in the morning a lunch cruise with music down the Seine was exactly what we needed. The cruise give you a great overview of what's in the area. It's very relaxing and the food and wine is amazing. Great experience food and service was fantastic! The was defiantly one of the highlights on our vacation. This was a lovely way to spend an afternoon. There wasn't any AC for most of the lunch so we were really, really hot. Thankfully they turned it on eventually. We loved this relaxing and charming boat ride. The food was good and lots of wine to drink. We chose the etoile service and had an inner table and were able to see everything. The music and singers were the highlight. Loved this tour and would recommend it. Last minute decision to book the front of the boat for 8 people. This cruise was the highlight of our trip to Paris!! A lovely experience. We paid a little extra for the window seat which was worth it, as it made the experience a bit more special. Good food and service and good wine options. Great experience cruising Seine River Lunch Cruise. Multicuisine food and variety of wine was awesome !! While boarding the cruise many of the tourists including us found some issues regarding our reservation. Our names were not in the manifest and we were told to wait for nearly 20 minutes. As they had booked us the next day that was on 29.9.18 which was not possible for us. It was their technical error, but the cruise was awesome EXCEPT some noise pollution by some Tourist as they were fully drunk and was not able to control themselves. Also the wash room urinals were overflowing and there was no proper drainage and finally the attendant has to do something to clear the blockage. It was very unhygienic. Crew should see that all the things are in proper condition.